Earth Day Ride: Connect the Dots – WeHo to LACMA’s Earth Day Event! Good news: Beverly Hills is taking some steps forward on bike routes and racks! But they need support to make it happen. Your presence is urgently needed at one of two upcoming meetings to advocate for streets that are safe and comfortable for cyclists of all ages and skill levels. And of course, cruise over to the Beverly Hills “Bicycle Ad Hoc Committee” Web page for official news and updates. Bill Nye the Science Guy predicts that bikes will figure big in the cities of the future. What do you think of his idea for wind louvres, so that no matter which way you’re going you always have a tailwind? Good News: Better Bike Lanes Approved for West Side! Now what? Remember a few weeks ago, when the Westside Council of Governments (WSCOG) was collecting public input on closing gaps in bike routes? Well, your input paid off: the recommendations were approved! But that doesn’t mean those lanes are going to get built. Now, it’s up to individual jurisdictions to create those lanes in accordance with the recommendations (or to come up with their own plan — the WSCOG recommendations are non-binding). 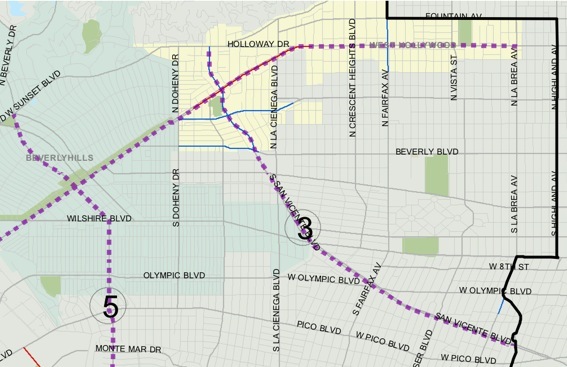 That means that the WeHo Bike Coalition will continue to press city officials to implement bike routes on the recommended streets — Santa Monica and San Vicente — in addition to other roads around town. And you can help! Come to our next meeting, April 17th at 6pm in the Plummer Park community building. See you there!